Here are our top picks of the best in-wall speakers of 2018 that deliver really crisp sound performance and are perfect for home theater or home audio applications. These speakers are specially designed to blend in with modern home interior décor and flush mount into the wall for a sleek appearance while saving space in your room. They produce plenty of volume and detailed sound quality and have a wide frequency range for smooth sound reproduction. These in-wall speakers are also great for home stereo applications for dual left and right channel speakers and provide a really good soundstage while watching movies or listening to your favorite soundtracks. Be sure to check out our top picks for the best in-wall speakers below! Be sure to also check out our top picks for the best ceiling speakers and Bluetooth ceiling speakers if you are looking for in-ceiling speakers to compliment your surround sound home theater audio system. The Polk Audio RC85is are some of the best in-wall speakers with a great combination of sound performance, quality design and value. They come as a pair of 2-way in-wall speakers which are timbre matched to the Polk Audio RTi series for sound imaging. The speakers are equipped with a one 8” dynamic balance mineral filled polymer composite cone for deep bass reproduction, and have frequency response of 32 Hz to 20 Hz. The speaker also comes with a 1” dynamic metalized soft dome tweeter with a 15 degree swivel mount for crisp highs and treble reproduction. The entire speaker is constructed from durable moisture-resistant material which makes them suitable for bathroom use or in the patio or under outdoor eaves. The speaker has a cut out dimension of 12 ¾” and a cut out width of 8 5/8” and a mounting depth of 2 15/16” inches. If you are looking for one of the best in-wall speakers that deliver great sound performance and value for money, the Polk Audio RC85is come highly recommended. The sound performance of the Polk Audio RC85is is really good and works really well for music and movies. They work extremely well as front left and right channel speakers or rear channel speakers mounted in the ceiling or in-wall. The RC85is produce really nice quality sound quality and have clean stereo sound performance. They are great when integrated into a home surround sound system as side speakers and provide a lot of crisp detail. Vocal performances sounded crystal clear through the RC85i speakers with detailed sound clarity, and musical notes were reproduced clearly without any distortion at high volume levels. These in-wall speakers do not produce much bass response by themselves and will need to be paired with a dedicated subwoofer to that extra lower-end frequency kick. That being said, the RC85is are acoustically accurate and provide plenty of presence and soundstage for musical performances. When we watched movies through the surround sound system with these speakers as frontal speakers, the dialogue and sound effects were crystal clear and the level of separation in the detail that you get is also very good. While these speakers do not produce audiophile quality sound, they provide great value and very detailed sound performance for any home audio or outdoor application. 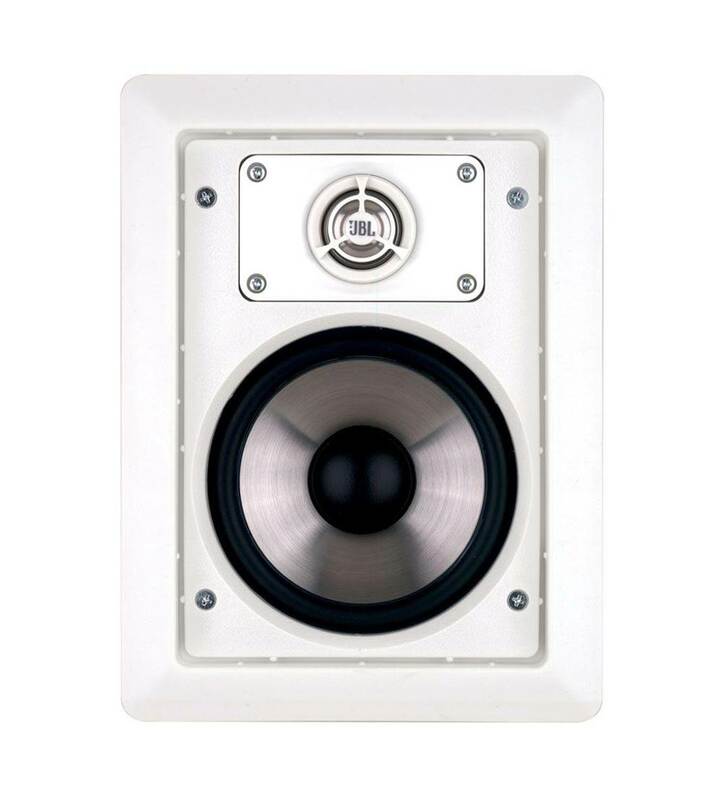 The Polk audio RC85s are relatively easy to install and only require you to cut a hole in the wall and feed the wires through. You can fit the speaker in place by rotating cams that secure the speaker into the wall without any extra materials or drilling required. The speaker also comes with paintable grille and flange which allows the in-wall speaker to blend into your wall and disappear in your room. The RC85i is made of quality materials and has an 8” mineral-filled polymer-composite cone with a rubber surround that is durable and well-constructed. It also comes with a swivel mount tweeter that is amiable for direct high frequency control and provides really good spatial imaging – you can project the sound where you want it to be in your room. The tweeter is well-designed and has great crisp highs and treble ranges in any position, including off-axis listening positions. The RC85i also features infinite baffle tuning which uses the virtual enclosure of in-wall space for much better bass response; it is also timbre-matched to the Polk Audio Monitor Series speakers if you want a full surround sound experience. The speakers come with 2 grilles, cardboard template and an owner’s manual for easy reference. The Verdict? 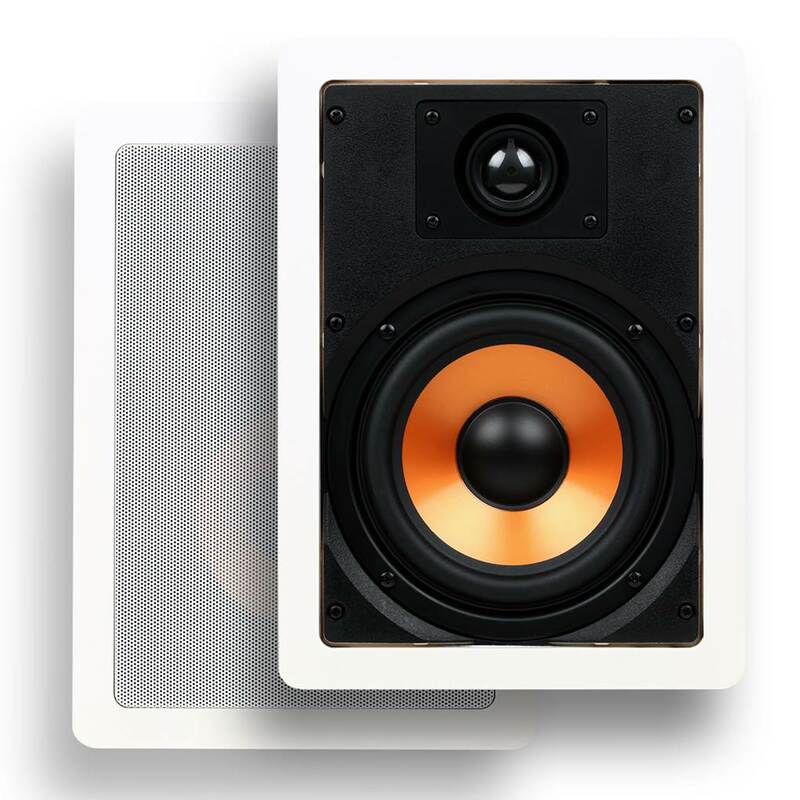 The Polk Audio RC85is are some of the best in-wall speakers that provide really good sound quality, durable construction and design. The speakers come with an 8” mineral filled polymer composite cone for better bass response and a 1” dynamic-balance soft dome tweeter with a swivel mount for crisp highs and an adjustable sound projection. Music and cinematic performances sound really crisp and detailed through the RC85is at any volume level – vocal performances were sharp and particularly well reproduced. The level of sound dispersion that you get from the RC85is is pretty good and it also uses virtual enclosure of in-wall space for better bass response. The entire speaker is also constructed out of durable materials which make it suitable for use in bathrooms, saunas or outdoor patios. The Polk speakers are great for enveloping sound imaging when used in a home theater system setup and delivers great sound clarity even in off-axis listening positions. Overall, if you are looking for one of the best in-wall speakers that will deliver superb sound performance, the Polk Audio RC85is are definitely the ones to go for. The Micca M-8S is one of the best in-wall speakers you can find that delivers great value for money and superb sound quality. The M-8S is a 2-way in-wall speaker with a high excursion 8” poly woofer and a 1” soft dome tweeter that delivers crisp highs and good treble ranges. It also provides for good integration between the tweeter and woofer with a 12Db crossover network for better bass synchronization. The M-8S deliver smooth and natural sound signature with crystal clear vocal reproduction and plenty of detail – it is designed for optimal sound performance for home theater applications or causal home listening. The Micca M-8S speakers are easy to install and can be painted to blend into any color – it also has an outer dimension of 10” (width) and 14.13” (height) with a cutout dimension of 8.75” (width) and 12.75” (height). They are also very easy to install with basic hand tools and have paintable grilles to match your home interior décor. On the whole, the Micca M-8S are some of the best in-wall speakers you can find and we highly recommend them. The sound performance of the M-8S is of a pretty good standard – they produce quality audio performance at maximum rated power and deliver crisp audio performance. They deliver really crisp sound performance at any volume level and do not distort when cranked up to the maximum volume setting which is pretty good. We also found that these speakers deliver pretty nice low-end bass response through the high excursion 8” poly woofer. When we used the M-8S as frontal speakers, the level of detail and sound performance that we got was really good. Movies and sound effects really come to life with these speakers, and music performances sounded detailed and crisp. Vocal performances sounded sharp and crystal clear without coming across as harsh. Instrumental music was smooth and well-defined, with plenty of soundstage and good degree of separation in the details. We were pretty impressed by the overall sound performance of the M-8S and it blends in nicely with most home theater and surround sound setups as frontal or rear speakers. The M-8S speakers are very well designed and blend in nicely into modern home décor without any issues. They are also easy to install and do not require complex wiring. The M-8S comes with a high excursion 8” poly woofer for good bass response and a 1” soft dome tweeter that delivers nice crisp highs and great clarity. We liked the fact that the silk dome tweeter has a pivoting design which allows you to aim the tweeters for a much more spacious soundstage. The M-8S in-wall speakers features an advanced crossover design with integration between the tweeter and woofer through a 12dB crossover network that provides good transition in the upper midrange frequencies. It is also compatible as background rear speakers or frontal speakers in a multi-channel home theater system. The speaker comes with an included template which you can use to mark and cut out the mounting hole; the built-in tabs also make installation of the M-8S speakers very simple. The mounting tabs are capable of securing the speakers on the surrounding drywall without additional screws. The Verdict? The Micca M-8S are some of the best in-wall speakers that delivers really good value and sound performance. They are designed for easy installation and come with mounting tabs for easy installation in the front of your living room or at the rear. The sound quality that we got from the M-8S speakers is crisp, clear and detailed. Vocal performances were reproduced with a good level of clarity. The speakers come with a high excursion 8” poly woofer and a 1” soft dome tweeter that delivers natural sound reproduction without any harshness. It also features a 12Db crossover network that integrates the tweeter and woofer for consistent sound quality. The M-8S speaker is easy to install and blends in nicely with home interior décor, and works well with home theater setups or just as front stereo speakers. While these are not audiophile-grade speakers, the level of volume and sound performance is pretty much on par with higher-end in-wall speakers. Overall, if you are looking for one of the best in-wall speakers that will deliver, the M-8S are definitely the ones to check out. 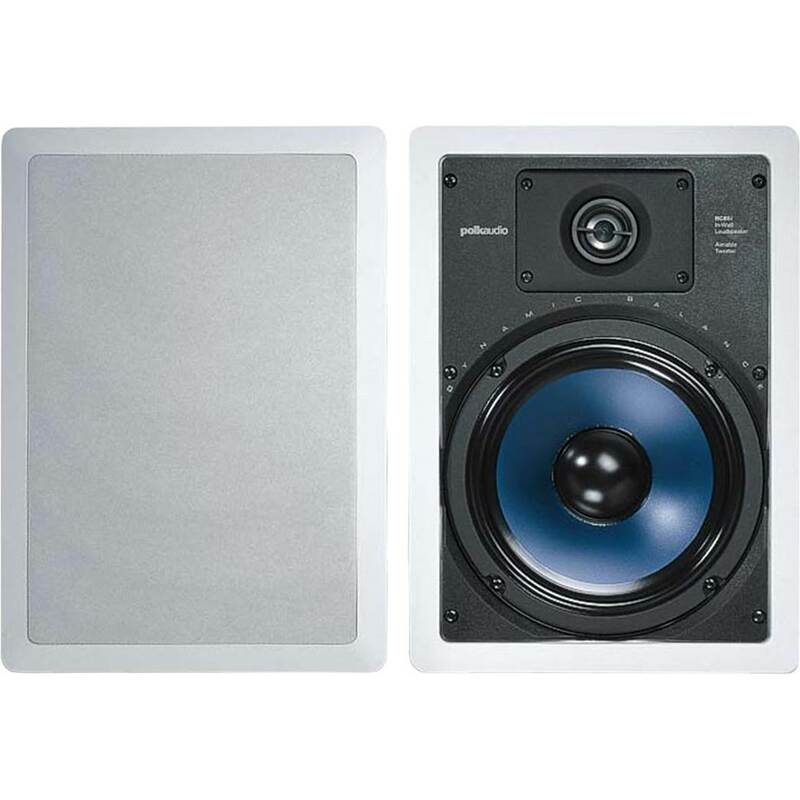 The Silver Ticket 652Ws are some of the best in-wall speakers you can find on a budget. These speakers are built primarily for quality sound performance and work well with home theater systems and surround sound speakers. It is a 2-way in-wall speaker with a 6.5” mica polypropylene cone woofer with a rubber edge and a 16.5oz magnet that delivers clear and distortion free sound performance. The Silver Ticket 652Ws feature a 20mm silk dome tweeter which produces smooth and crisp sound performance and comes with a 15 degree pivot for sonic imaging and sound placement. The speakers also have a really wide frequency response of 60 Hz to 20kHz and a sensitivity of 88+/-2 dB have an impedance of 8 ohms. 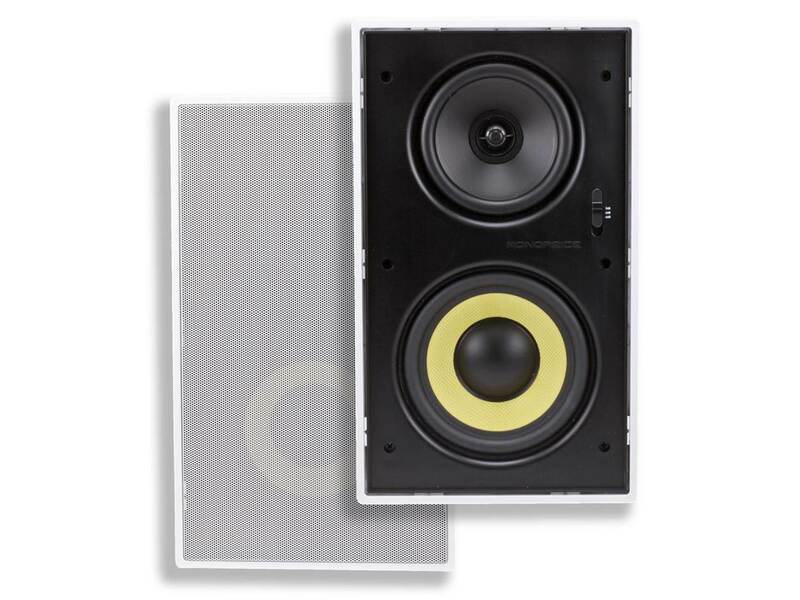 These in-wall speakers have nominal power of 40 watts and a peak power of 80 watts. They are also solidly constructed with moisture resistant materials for use in bathrooms, saunas or outdoor patios. Overall, the Silver Ticket 625Ws are some of the best in-wall speakers you can find on a budget and we highly recommend them. The sound performance of the Silver Ticker 82C is really crisp and well-defined. They are high performance speakers that have plenty of volume, musical separation and detailed sound performance. They work really well when installed beside the TV and provide really clear and vibrant stereo sound performance. The sound effects from movies and music soundtracks were cleanly reproduced with crystal clear clarity. Vocal performances were sharp and well-defined without any harshness at high volume levels – the speakers are also pretty responsive to EQ adjustments and deliver pretty good midranges and lower-frequency tones. While the bass response on the Silver Ticket 82C is not bad, it would definitely benefit from the addition of a dedicated subwoofer to the in-wall speaker system. The lower-bass frequency ranges were surprisingly well-defined and audible enough to be heard from the speakers, although nothing of the room-thumping type. The 82C speakers also work as frontal or rear speakers for detailed surround sound performance in home theater setups. The Silver Ticker 82C speakers come with everything you need to get started together with installation parts. The speakers are solid and heavy with good quality, and come with a cloth like material behind the grill to keep dust from entering into the woofer. They are really good in-wall speakers that are suitable for 5.1, 6.1 and 7.1 home theater systems. The woofer cone in the speakers is filled with injection-mold mica polypropylene to ensure high quality long lasting sound performance and durability. It also comes together with a high-grade rubber edge for better audio accuracy. We liked the 20mm silk dome tweeter inside these speakers which pivots for tuning and sound placement, although we would not recommend tiling the tweeter too much. The speakers do not sound harsh or distort at very high volume levels which is definitely an added plus. It also comes with a flip-level quick-mount system which makes installing the speaker easy and secure; the speaker also includes a wall hole cut-out template and paint masks for ease of installation. The Verdict? 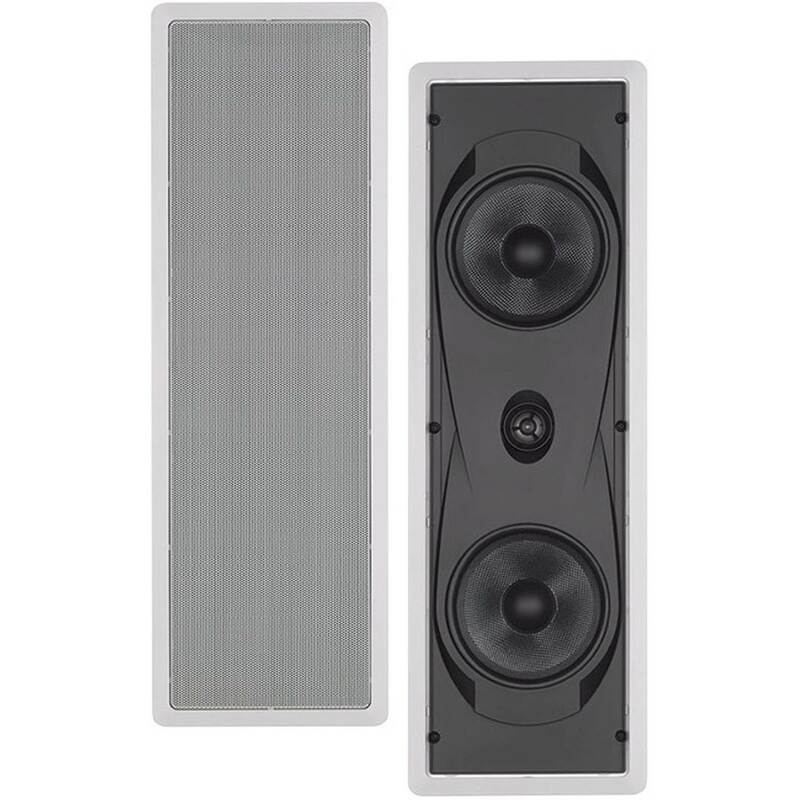 The Silver Ticket 82C speakers are some of the best in-wall speakers you can find on a budget that delivers great sound quality. It is essentially a 2-way in-wall speaker with a 6.5” polypropylene cone woofer and 20mm silk dome tweeter that delivers crisp highs, nice midranges and a surprisingly amount of bass. While the bass response will not rock your entire room, it delivers a good low end punch and is audible enough to be felt. The speakers have a really wide frequency response of 60 Hz to 20 kHz with an impedance of 8 ohms and a crossover of 12dB per octave. The speaker also has a power capacity of 40 watts nominal or 80 watts peak power. Overall, they are some of the best in-wall speakers that are solidly constructed with moisture resistance and can be used in bathrooms, outdoor patios or home theater applications. 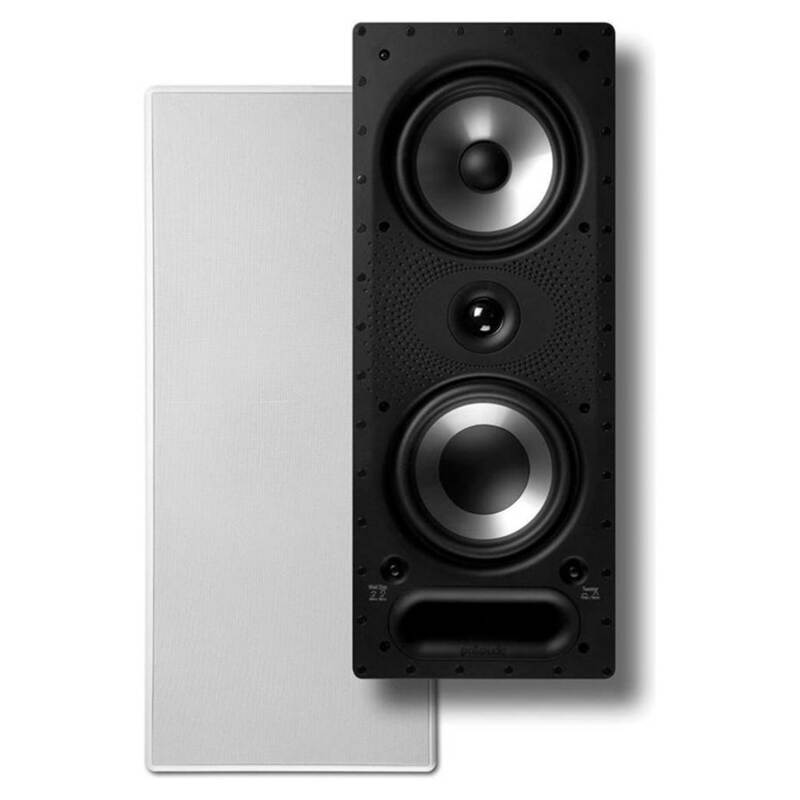 If you are looking for in-wall speakers on a budget, the Silver Ticker 82Cs could be your best bet. The Monoprice Caliber 8” Fiber 3-way speakers are some of the best in-wall speakers available that deliver excellent sound performance. These speakers are specifically engineered to deliver crisp sound with crystal clear dialogue and sound effects. It features DuPont Kevlar fiber cone drivers that deliver clean bass reproduction and comes with a light transducer for natural sound reproduction with less distortion at higher volume levels. The acoustic drivers in the Monoprice 8” speakers deliver detailed sound clarity with clean vocals and dialog – it comes pivoting titanium silk dome tweeters which allow you to point the speakers in a certain direction and create better soundstage. They also work very nicely while integrated as home theater speakers and home audio speakers in a surround sound setup. The speakers also come with no logo grills for a sleek installation and blends in nicely with home interior décor. The sound performance of the Monoprice Caliber in-wall speakers are nothing short of spectacular. The precision titanium silk dome tweeters that come with these speakers deliver really crisp highs and very good sonic clarity – it also has a 100 watt nominal and 200 watts maximum power handling capacity. You can really crank up the volume on these speakers and they will produce really clean and crisp sound quality without any distortion. The speakers also have a really wide frequency range between 50 Hz to 20 kHz which allows it to practically reproduce the entire audio spectrum clearly. The level of stereo sound clarity that you get from these speakers is extremely good – sound effects from movies were very nicely reproduced with distinct clarity. Music soundtracks sounded smooth, crisp and well-defined and you can literally pick up the finer details in the music that you might not have heard before. The lower-end frequency response on these speakers is pretty good and the bass can be heard and felt in the room, although they would definitely benefit from the addition of a dedicated subwoofer if you want a full blown home theater experience. The sound quality that you get with these in-wall speakers is suitable for higher-end surround sound systems. The Caliber 8” speakers are relatively easy to install and blend in nicely with modern home interior décor. It features a removable and paintable grille design that is easily mountable. The Caliber in-wall speakers are also sonically matched to provide uniform sound coverage in your room – they work well for living room applications to a full 7.1 home theater system as rear or frontal speakers. They also feature a well-built construction with Kevlar fiber cone woofers for distortion-free sound reproduction, oversized magnets for more impactful bass, as well as precision titanium silk membrane dome tweeters for crisp highs and sonic clarity. The speakers come with an adjustable crossover switch with 8 ohms nominal impedance. The speakers have a cut out dimension of 12.8” x 8.7” x 3.6” and an overall dimension of 14.1” x 10” x 3.9”. It also has a 9” Kelvar woven cone with a 30 oz magnet and rubber surround for the woofer and a 3” Kevlar woven cone with a 5.4oz magnet for the midbass sound performance. Overall, the construction of the Caliber in-wall speakers is durable, tight and very nicely made with great attention to detail. The Verdict? The Monoprice Caliber 8” Fiber 3-way speakers are really some of the best in-wall speakers you can find that delivers very good sound quality – they are an excellent combination for higher end surround sound systems as frontal stereo or rear speakers. The sound performance from these speakers is crisp, crystal clear and clean. They have solid treble ranges and well-defined midranges, with a good level of bass impact. Vocal performances sound almost concert-like through these speakers with great attention to detail. They also work well as front dialogue speakers for movies and musical soundtracks with no-frills sound performance. These in-wall speakers are really well made and designed with pivoting titanium silk dome tweeters that can be used to pivot and adjust the sound projection. It also comes with a no-logo grille which you can use to cover the speaker and blend it in with your home interior décor. Overall, the Monoprice Caliber 8” speakers are some of the best in-wall speakers we have tested for its sound quality and we definitely highly recommend them if you are in the market for top-notch in-wall sound quality. The Klipsch R-5502s are some of the best in-wall speakers you can find that delivers sharp crystal clear vocals and music performance. They are essentially in-wall speakers on the higher end of the spectrum that you would get for high-end sound systems and home theater setups. The R-5502 speakers come equipped with a 1” titanium diaphragm compression driver mated to a pivoting 90 degree x 90 degree square Tractrix Horn for natural sound reproduction. It also comes with dual 5.25” cera-metallic cone woofers for lower-midrange frequency reproduction. These speakers work well as right, center or left channel usage and can be mounted both horizontally and vertically depending on your preferences. The R-550s feature Klipsch’s horn-loaded technology which increases acoustic output and volume levels without causing any distortion. If you are looking for one of the best in-wall speakers with a superb level of detailed clarity, the Klipsch R-5502 come highly recommended. The sound performance of the Klipsch R-5502 is exceptionally clear and precise. The sound is crisp and clear and has a great range with nice balance. When we used these speakers as frontal left and right channel speakers connected to an Onkyo amp, they work superbly well with crisp details and detailed stereo reproduction. The level of soundstage and separation that you get with these speakers is way better that what you would expect of in-wall speakers – they make movies and sound effects come to live, while vocal and instrumental performances had a level of spaciousness that we rarely heard before. Movie dialogues are crystal clear and the sound is consistent at almost any volume level – you can really crank up the volume on these in-wall speakers and they can rock your entire room without any distortion. At 30% volume, these speakers are practically loud enough to drown out conversational sounds in your room. That being said, these speakers excel in terms of crisp highs and vocal sound clarity but lack a measure of bass response – they would work perfect when accompanied by a decent subwoofer to enhance the lower end frequency response. The Klipsch R-5502s are really well-constructed and durable. The grills on the R-5502s can be spray painted and the grill holes are small and easily to plug in – this allows you to easily blend in the speakers into your modern home interior décor without any issues. The speaker goes around 3.9” deep into the wall although you will need to cut a hole in the wall to install the speaker. They are extremely versatile speakers which can be used for left, right and center channels and also features horn-loaded technology which increases its acoustic output and volume level. The speaker can also be mounted horizontally and vertically depending on your preferences. We liked the fact that the speaker comes with dual 5.25” cone woofers which delivers pretty good bass and lower-end frequency response. It also features a titanium compression driver mated to a square Tractrix horn for natural frequency production. The Verdict? The Klipsch R-5502s are some of the best in-wall speakers you can find that truly delivers superb sound clarity and performance. They are essentially in-wall speakers that you can use for higher-end sound systems and work well as left, right or center channel speakers. It also features Klipsch’s signature horn-loaded technology which increases volume output and sound levels without any distortion. They are also relatively easy to install and mounts horizontally or vertically depending on your preferences. The level of sound clarity and detail that you get with the R-5502s is excellent – vocal performances come across as crystal clear, while sound effects were accurately refined and delivered with good soundstage and spaciousness. The volume on the R-5502s can get really loud and they will easily fill up a large room without any issues – at 30% volume these speakers were practically loud enough to drown out conversational banter. These speakers are also relatively easy to install and come with paintable grills to blend into your home décor. 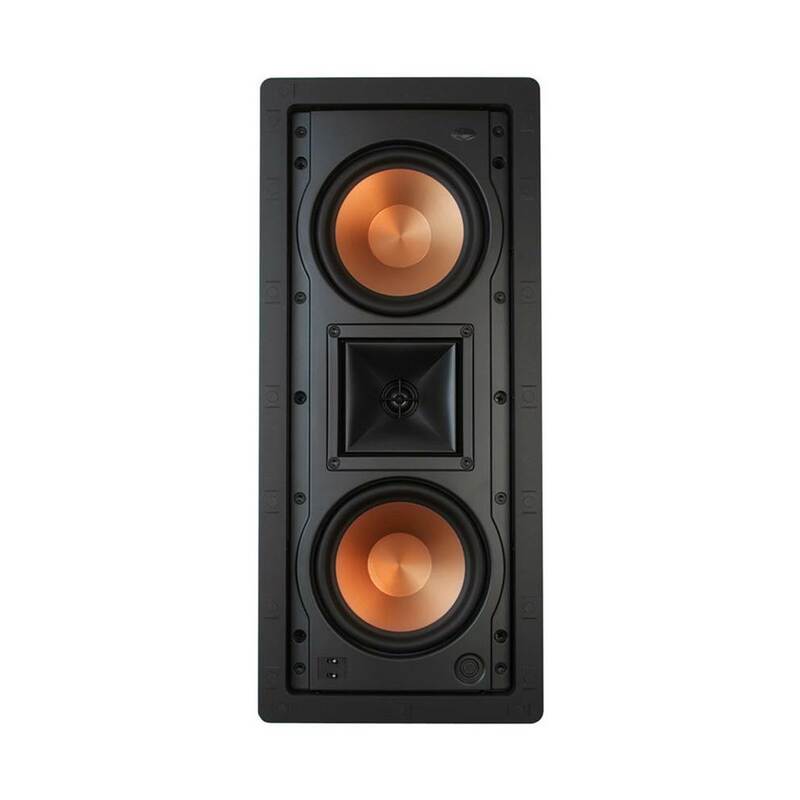 Overall, the Klipsch R-5502s are easily some of the best in-wall speakers that you can find that really deliver on sound quality and are worth a closer look. The Yamaha NS-IW760s are some of the best in-wall speakers you can find that delivers really nice sound quality with a broad frequency range. They are well-designed speakers that easily blend into modern home décor and are relatively easy to install. It comes with dual 6.5” cone woofers that produce deep and punchy lows and a 1” soft dome tweeter for crisp highs and vocal performances. The speakers can get pretty loud and has a 130 watt maximum input capacity which means that it can fill up large rooms with filling sound without any issues. The speakers have a really broad frequency response between 50 Hz to 24 kHz and can really reproduce the entire audio spectrum with clarity. They are also easy to install and mounts flush against the wall, which means that your guests will not be able to spot these speakers easily. They are also great for surround sound systems and home theater setups. Overall, the Yamaha NS-IW760s are some of the best in-wall speakers we have tested and we highly recommend them. The sound performance of the Yamaha NS-IW760s is clean, detailed and crisp. The highs and midranges are very clear and well-defined, and produce very good dialogue performances while watching movies. We tested these in-wall speakers are front and rear speakers and they work really well to reproduce crystal clear sound effects and treble ranges – you can also pick up details in the music or instrumental notes that you might not have noticed before. Watching movies with the NS-IW760 speakers will help you appreciate musical overtones and effects which enhances the overall cinematic experience. While the bass response on the NS-IW760s are somewhat lacking, they more than make up for it in terms of the crisp highs and nice midrange tones. The vocal clarity that you get with these speakers is crystal clear and distinctly reproduced, and you really get good frequency ranges from the lower-midrange to the upper highs. If you are looking for a set of in-wall speakers to compliment your home theater setup, these speakers may be your best bet. The Yamaha NS-IW760s are relatively easy to install and come with a cardboard template which you can use to cut out a hole in the wall – once you connect the cables and screw in the mounts, the speakers will be installed without any further tweaking required. These speakers can be mounted vertically or horizontally depending on your preferences and mount flush into the wall which is great – it blends normally into home interior décor with a low-profile design. We also liked the fact that these speakers have a 130 watt maximum input capacity and you can really crank up the volume on these speakers without hearing any distortion. The speaker itself comes with two 6 ½” cone woofers, 1” soft dome tweeters and paintable speaker frames and grilles for easy installation. The Verdict? The Yamaha NS-IW760s are some of the best in-wall speakers we have tested with a solid frequency range and sound performance. These speakers are an ideal combination for home theater speakers or surround sound systems, and mount flush into the wall. They produce really crisp and crystal clear sound performance – it has a wide frequency range between 50 Hz to 24 kHz and delivers clean and clear dialogue. Music performances sound sharp and well-defined through these speakers, and you can even pick up sound effects from these speakers while watching movies. They also work really well in a 7.1 home theater setup as rear or front stereo speakers. That being said, we found that the bass response on the NS-IW760s was somewhat lacking – you may require a dedicated subwoofer for this speaker to get the best sound performance. In terms of volume, they are also capable of pumping out a clean 130 watts of pure sound performance which is really good. On the whole, the NS-IW760s are some of the best in-wall speakers with full-range sound performance and we highly recommend them. The Theater Solutions TS50W are some of the best in-wall speakers in the mid-tier range that delivers a great combination of design, sound quality and durability. They are essentially 2-way in-wall speakers with a recommended power between 10 to 200 watts per speaker, and have a wide frequency response of 50 Hz to 20 kHz with a power efficiency of 93dB. The speakers come equipped with 5.25” woven fiber cone woofers with butyl rubber surrounds for durability, silk titanium dome tweeters that can pivot for soundstage, and spring loaded raw wire connections. 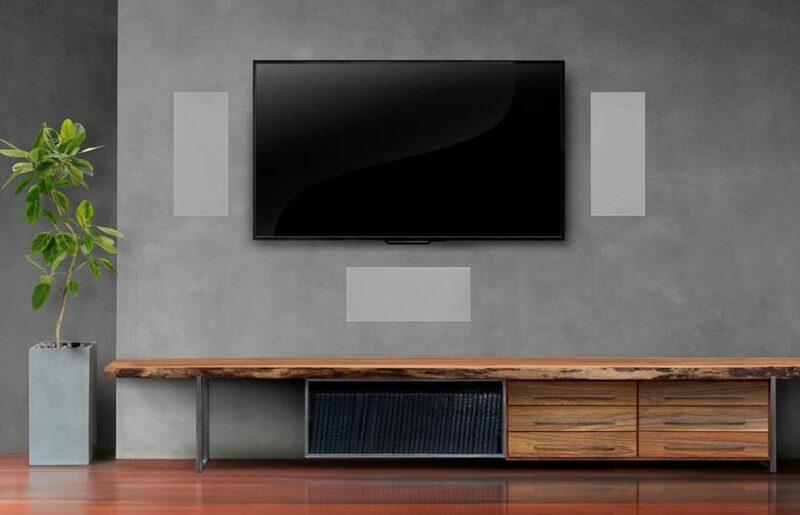 The TS50Ws come with paintable frames and grills with a low profile housing design for easy installation – it also has a unique wall locking mounting system for you to affix these speakers into the wall without any additional equipment required. They have a cut out side of 9.5” x 6” per speaker and a mounting depth of approximately 2.25” per speaker. Overall, the Theater Solutions TS50Ws are some of the best in-wall speakers you can find in the mid-tier range and are worth a closer look. The sound quality of the TS50Ws is really good and rivals that of higher-end in-wall speakers that we tested. The highs and midranges are crisp and clear, particularly the treble ranges where you can hear vocals and instrumental notes with crystal clear clarity. The bass response on the speakers is also decent and does not overwhelm into the midranges. These speakers work very well as frontal stereo speakers or rear speakers for surround sound effects. Watching movies with the TS50Ws was a really enjoyable experience, with sound effects clearly articulated with great efficiency and distinct clarity – you can even start to pick up notes in the music which you might not have noticed before. We also liked the fact that the tweeters on the TS50Ws are pivoting which means that you can adjust them to get the best soundstage and musical separation that you need. The Kevlar woofer on this speaker also delivers nice punchy lower-midrange frequencies which add a nice touch to musical soundtracks. We would recommend using a stereo or home theater amplifier with at least 100 watts per channel for best results with the TS50W speakers. The TS50Ws are really well designed speakers that mount flush into the wall without looking obtrusive. 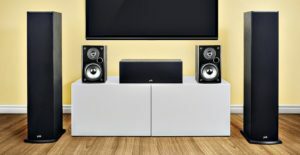 They can be used as frontal speakers or rear speakers in a 5.1 or 7.1 home theater setup – they can also be mounted horizontally or vertically depending on your preferences. The speaker is constructed from high quality moisture resistant materials which allow them to be used in moisture-prone environments including bathrooms and outdoor patio areas. Each speaker comes with swing-out leg mounting for easy installation without additional hardware – they also come with paintable white aluminium grilles that offer rust and moisture protection. The speaker features a woven Kevlar 5.25” driver that provides full range tones and also a 1” pivoting silk and titanium dome tweeter that pivots to provide a good soundstage. The speakers have a cut out size of 8.5” x 6” per speaker with an overall size of 11” x 7.5” and a mounting depth of 2.25”. It works great for home audio entertainment, surround sound, home theater or commercial applications such as store or restaurant speakers. The Verdict? The TS50Ws are some of the best in-wall speakers you can find that delivers crisp and well-defined sound quality. They are a really solid set of in-wall speakers in the mid-tier range that can rival higher-end sound systems. It has a really good frequency range of 50 Hz to 20 kHz and features a 2-way design with an 8 ohm impedance. The recommended power per speaker is 10 to 200 watts although we would suggest using an amplifier with at least 100 watts per channel for these speakers. We liked the fact that the TS50Ws come with 5.25” woven cone woofers and pivoting silk titanium dome tweeters for extended highs and good lower-midrange frequency response. It also comes with paintable frames and grills with low profile housings that is designed for easy installation. The TS50Ws have a unique wall locking mounting system that makes installation a breeze without additional mounting hardware. They are perfect for home theater and surround sound applications as frontal or rear speakers and can be mounted horizontally or vertically. Overall, the TS50Ws are some of the best in-wall speakers that delivers above expectations and we highly recommend them. The Leviton AEI65s are some of the best in-wall speakers you can find that delivers deep bass response and clear musical sound reproduction. They essentially come as a pair of 6.5” two-way in-wall speakers with a power capacity of 100 watts and 8 ohms impedance. It also comes equipped with JBL titanium-laminate drivers that maintain great musical accuracy and clarity at any volume level. The AEI65s come with a straight-line signal path crossover network for minimal signal distortion as well as elliptical oblate spheroidal waveguide technology for high-frequency sound dispersion. These in-wall speakers also feature long-excursion woofers with butyl-rubber half-round surrounds and extended pole-piece magnetic structures for enhanced bass reproduction and dynamic range. To top it off, it comes with a low-diffraction swivel tweeter mounting system for optimal stereo imaging and soundstage. Overall, the Leviton AEI65s are some of the best in-wall speakers you can find that delivers excellent bass reproduction and crisp sound. The sound performance of the Leviton AEI65s is crisp, clear and well-defined. They have really good sound quality and emphasis on the midrange frequencies which makes watching movies and listening to soundtracks with these speakers a really enjoyable experience. These speakers are great as frontal stereo speakers or as rear speakers in a 5.1 or 7.1 surround sound setup. When used as front channel speakers, they produce extremely clear dialogues and sound effects for cinematic movies. We would recommend using a dedicated amplifier with at least 100 watts per channel for these speakers to achieve optimal sound effects. You can practically tune up the AEI65s up to maximum volume and they can easily fill up a large room with sound without any distortion. Music performances, particular those bass-heavy music genres such as electronic dance music, sounded vibrant and very enjoyable to listen to with punchy beats. The lower-midrange frequencies sound very nicely articulated on the Leviton AEI65s with distinct sound reproduction. In terms of sound quality, it’s difficult to go wrong with the AEI65s especially if you are looking for in-wall speakers with good bass. The Leviton AEI65s are really well-constructed and feature a solid and durable design. They are relatively easy to install and mount flush into the wall without any issues. They work really well for home theater or surround sound applications as frontal left or right speakers or rear speakers. We liked the fact that these speakers come with Elliptical Oblate Spheroidal waveguide technology which improves high frequency sound dispersion at any volume level – this allows the speaker to generate focused frontal sounds for precise sonic imaging. They are also relatively easy to drive with a 100 watts power capacity rating with 8 ohms impedance. The speaker comes with JBL titanium-laminate drivers that maintain musical accuracy and clarity with a straight-line signal path crossover network for minimal signal distortion. In terms of audio specifications and design, the Leviton AEI65s really do deliver great value and high quality specifications. The Verdict? The Leviton AEI65s are some of the best in-wall speakers you can find that delivers a solid punch. They come essentially as a pair of 6.5” two-way in-wall speakers with JBL titanium-laminate drivers, waveguide technology and long-excursion woofers with butyl-rubber half-round surrounds. It also comes with a low-diffraction swivel-tweeter mounting system for optimal stereo imaging and maximum bass impact. We were very impressed by the sound quality of the Leviton AEI65s when we first tested out these speakers – the highs and midranges were crisp and well-defined, while the bass hits hard and sounds punchy. These speakers definitely do produce more bass than you would expect from an in-wall speaker, although it would also benefit from the addition of a dedicated subwoofer. The butyl-rubber half-round surrounds and extended pole-piece magnet structures provide dynamic range and durability for the speakers – they are also easy to mount and install in-wall and mount flush into the room décor. Overall, the Leviton AEI65s are one of the best in-wall speakers available at the moment, so don’t forget to check them out! The Klipsch R5650-Ws are some of the best in-wall speakers you can find in the high end range that delivers superb audio clarity. They are essentially high-end speakers designed for serious audiophiles who want the best sound quality in their home theater or surround sound setup. The R5650s feature a 1” titanium dome compression driver mated to a 4” square Tractrix horn for crisp highs and detailed sound clarity. The speaker also comes with a 6.5” cerametallic woofer that delivers deep bass response and better lower-midrange frequencies. The R5650s also comes with Klipsch’s signature horn-loaded technology which increases acoustic output volumes while reducing distortion. The horn tweeters are capable of pivoting in any direction to get a better soundstage and position. The R5650s also come with treble and midbass attenuation switches and IR receiver knock out for you to adjust the sound performance according to your preferences. On the whole, the Klipsch R5650s are definitely some of the best in-wall speakers for high-end audio setups and are great for audiophiles who want to hear sound effects and dialogue at their finest. The sound performance of the Klipsch R5650s is solid and crystal clear, with very crisp highs, detailed midranges and great bass impact. They provide really clean sound in-wall at any volume level; you can also tune these speakers up to maximum volume and they will not distort which is great. The volume that these speakers can produce is phenomenal – at 30% volume they can get really loud and fill up the entire room with sound. The speakers do produce a good deal of bass response which is great for sound effects and bass-heavy music genres. The 6.5” woofer really does the job of hitting hard at the lower-end frequency ranges and sounds really crisp. When used as frontal speakers, the Klipsch R5650s deliver smooth and crystal clear dialogues with detailed sound effects and spaciousness – you feel like you are sitting in a real life theater while listening to the R5650s. The level of stereo imaging that you get is incredibly detailed, with clear distinction between the left and right speaker channels. Vocal performances sounded very crisp and well-defined with a clear sense of soundstage – the vocal clarity is distinct and subtle notes can be heard through these speakers. In terms of sound quality, it is rare to come across such speakers with such a good deal of sonic articulation and spatial imaging. 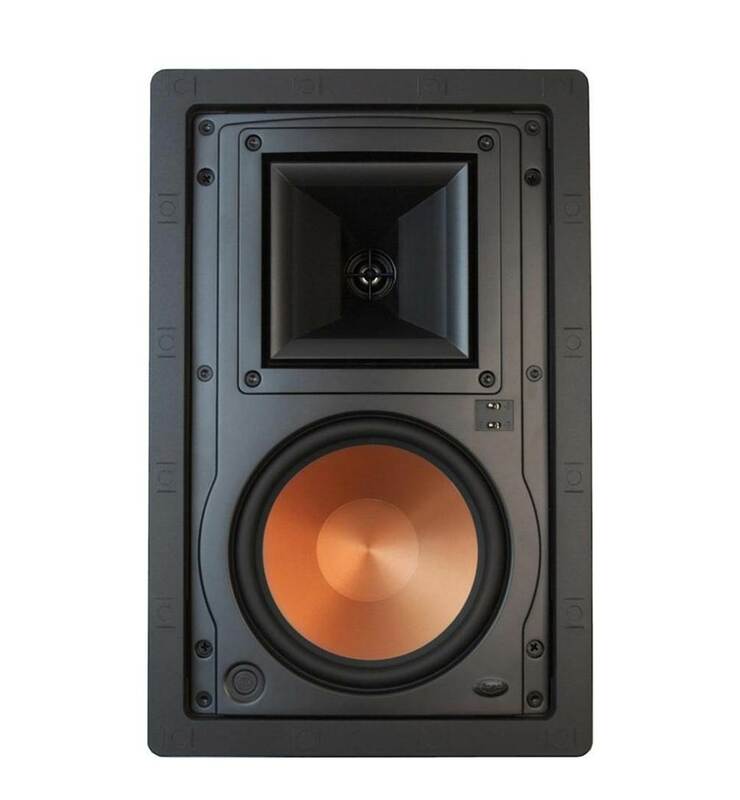 The Klipsch R5650s are very well designed and features a full solid construction. They are easy to install and mount into the wall and flush mount which allows them to blend into modern home interior décor. They are really responsive and sensitive speakers and can also be tuned according to your sound preferences. They have a dimension of 14.3” x 9.3” and a cutout dimension of 13” x 8”. 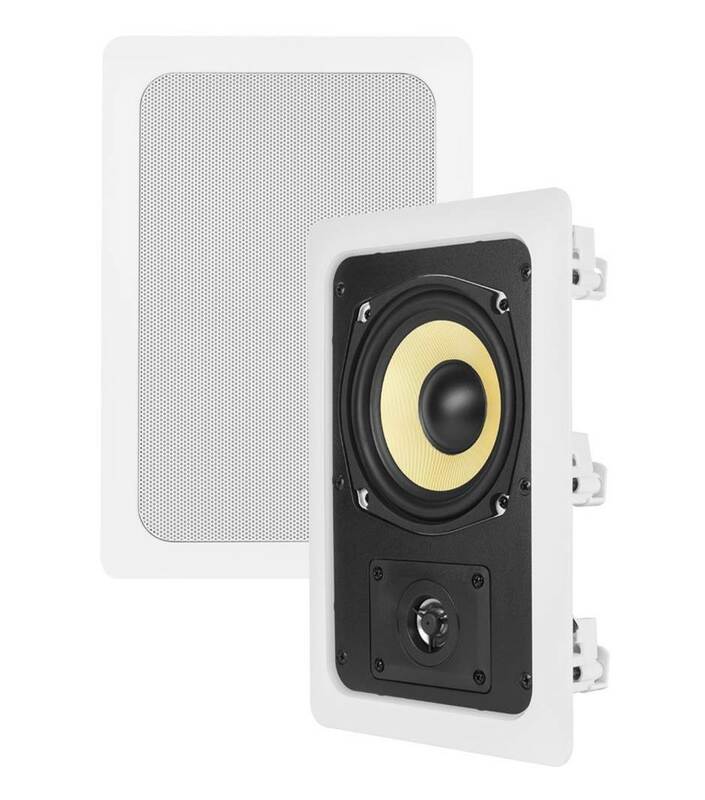 The mounting depth of these in-wall speakers is 3.75” and they come with a white paintable frame and grill for easy installation. They work best in a 7.1 or 5.1 home theater setup as frontal and rear speakers and can be mounted horizontally or vertically. It features a 1” titanium dome compression driver and a 6.5” cerametallic woofer for distinct sound quality. We liked the signature Horn-loaded technology which helps to increase the amount of volume output while reducing distortion. The R5650s also have a pivoting Tractrix horn tweeter that delivers clear sound in any direction and allows you to project a much wider soundstage in your room. The treble and midbass attenuation switches work nicely if you need to adjust the treble ranges and highs. The Verdict? The Klipsch R5650s are some of the best in-wall speakers you can find that delivers sound performance above expectations. The level of sound quality that you get with these speakers is top-tier and suitable for audiophile surround sound applications. The pivoting horn tweeter delivers clear sound in any location and can be adjusted to provide a much wider soundstage. The R5650s also features Klipsch’s horn-loaded technology which increases acoustic output while significantly reducing distortion at maximum volume levels. The 6.5” woofer delivers deep bass reproduction and very good midranges and lower-midrange frequencies. You can literally re-listen to your music soundtracks and pick up details in the music which you might not have noticed before. We also found these speakers relatively easy to install and has a mounting depth of 3.75”. It comes with a white paintable frame and grills and mounts flush into the wall to blend in with modern home décor. Overall, the Klipsch R5650s are some of the best in-wall speakers we have tested and are worth checking out if you are an audiophile looking for a high-end surround sound setup. The Polk Audio 265RT is one of the best in-wall speakers with a 3-way speaker design. It comes with one silk polymer tweeter, two 6 ½” composite polymer and drivers with rubber surround. The speaker has an extremely wide frequency range between 30 Hz to 27 kHz for full range dynamic audio reproduction. This in-wall speaker is easy to install and great for high performance audio systems – it blends in nicely into home interior décor and suits your home environment really well. They have a -3 dB limit at 45 Hz and also include Polk’s power port bass venting system for enhanced lower-midrange frequencies. The Polk 3-way speaker includes the tweeter, woofer and a midrange speaker for full spectrum audio performance and clear dialogues, and provides much fuller sound as compared to other 2-way in-wall speakers in a similar category. Overall, the Polk Audio 265RTs are some of the best in-wall speakers with great full-range sound quality and we highly recommend them. The sound performance of the Polk Audio 265RT is really crisp and well defined. The sound quality feels crystal clear and well-balanced, although we found that the lower-bass response somewhat lacking. We would recommend pairing these speakers with a dedicated subwoofer to get the bass depth that will enhance the lower-end spectrum on these speakers. They are also pretty responsive to EQ changes on the audio receiver and we would recommend tweaking these settings to get the optimal sound performance. They work great as front right and left speakers and produce clean dialogues with detailed sound effects. Vocal and instrumental performances sounded clean and crisp throughout – you can even start to pick out notes in the music which you may not have noticed before. We also liked the fact that the 265RTs produce tonnes of volume – you can literally crank up the volume on these speakers close to maximum and they will not produce any distortion – provided that you have the right surround sound receiver to power them. In terms of sound quality, the Polk Audio 265RTs does deliver good sound although the bass response could be improved with a dedicated subwoofer. 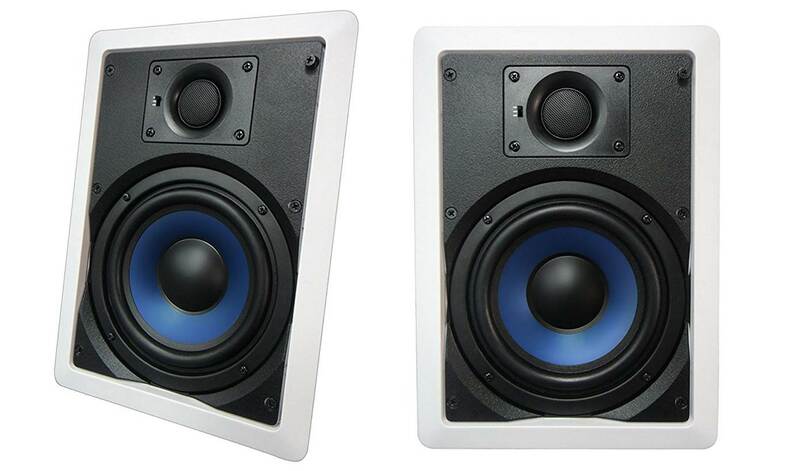 The Polk Audio 265RTs have a really clean and sleek design that blends in easily into modern home interior décor. They look very clean when installed and flush mount into the wall. The speakers do have a really low-profile which makes them unobtrusive and unnoticeable when installed in the room; they also come with magnet covers that are easy to take off compared with other in-wall speakers. These speakers can also be installed horizontally or vertically depending on your preferences and room requirements. While these speakers produce really crisp and clear dialogues and vocals, they would definitely benefit from the addition of a dedicated subwoofer for extra depth. You can also tweak the EQ settings on your audio receiver to adjust the sound performance on the Polk Audio 265RTs for better sound output. The bass port that comes with the speaker looks great and helps to enhance the midrange frequency reproduction. They are relatively easy to install and look very clean and sleek when mounted into the wall. The Verdict? The Polk Audio 265RTs are some of the best in-wall speakers you can find that delivers smooth and crisp sound performance. They are particularly good at delivering crisp highs, solid midranges and smooth trebles. The 3-way speaker has a frequency response between 30 Hz to 27 kHz which is really wide, and comes with one tweeter, one woofer and midrange driver with rubber surrounds for detailed sound reproduction. The speaker itself has a rectangle shape and mounts flush into the wall – it blends into modern home interior décor easily. It also comes with a power port bass vent to enhance the lower-end frequency reproduction, and has a lower -3 dB limit at 45 Hz. That being said, the bass on the 265RTs is slightly lacking and will definitely benefit from the addition of a dedicated subwoofer. The speakers are also relatively easy to install and basically vanish once fully wall mounted. Overall, the Polk Audio 265RTs are some of the best in-wall speakers we have tested with a 3-way construction and we highly recommend them.